(Top) Robotics@Maryland President Paul Goldin describes to the diver how the team wants their robot, Tortuga, angled through the starting gate as the team prepares for an autonomous run. (Bottom) The Robotics@Maryland team poses at Baltimore-Washington Airport. Photos courtesy of Robotics@Maryland. Robotics@Maryland placed third at the Association for Unmanned Vehicle Systems International (AUVSI) and Office of Naval Research (ONR) 13th Annual International Autonomous Underwater Vehicle Competition in San Diego, Calif., last weekend, taking home $2,250 in prize money. The Maryland student team competed against 21 other teams from across the globe, including Virginia Tech, University of Southern California, University of Florida, McGill University, North Carolina State University, U.S. Naval Academy, and Cornell University, whose team placed first in the competition. The goal of this competition is to advance the development of autonomous underwater vehicles (AUVs) by challenging a new generation of engineers to perform realistic missions in an underwater environment. This event also serves to foster ties between young engineers and the organizations developing AUV technologies. Each team was asked to design and build an autonomous underwater vehicle capable of navigating realistic underwater missions. 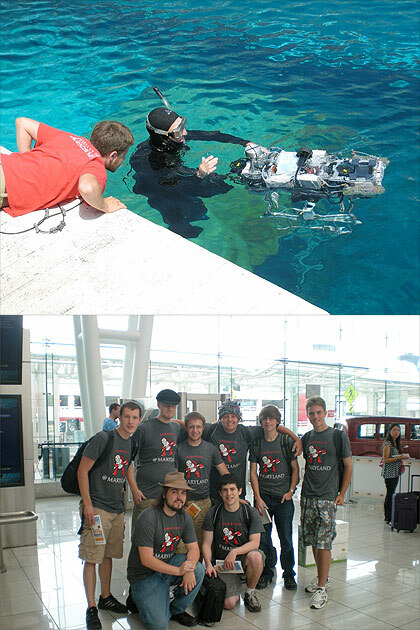 In 2008, the Robotics@Maryland team won the AUVSI competition in only its second year of participation. The Robotics@Maryland team comprised of students from various disciplines across campus, including Electrical and Computer Engineering, Mechanical Engineering, Physics, Mathematics, and Aerospace Engineering. The team was assisted by Prof. Dave Akin in the Space Systems Lab and Prof. Nuno Martins, who serves as faculty advisor, and traveled to San Diego to join the team at the competition. The team is sponsored by the National Science Foundation, the Department of Electrical and Computer Engineering, the Department of Aerospace Engineering, the Institute for Systems Research, the Clark School of Engineering, the Department of Computer Science, the Space Systems Lab, the Student Government Association, and the UM Office of the Vice President for Research, and also receives corporate support from Clark School Corporate Partners BAE Systems, Lockheed Martin, and Northrop Grumman, as well as SAIC, Apple, Hokuyo, The J. Craig Venter Institute, and MEMSense. The Robotics@Maryland team benefited from a particularly useful and unique facility at the Clark School's Neutral Buoyancy Research Facility in the Space Systems Laboratory on the University of Maryland campus—the only such university-based facility in the country. The 50-foot diameter, 25-foot deep water tank is used to simulate the microgravity environment of space. Prof. Akin has allowed the student group to test their autonomous underwater robot, which has proven a valuable environment for practicing the robot's maneuvering capabilities. For more information about Robotics@Maryland, visit ram.umd.edu.